The Super Soaker Tornado Strike is one of the new models released for 2011. It apparently features spinning water stream action like the older Super Soaker Helix, but with modern styling. Like the Super Soaker Thunderstorm, the Super Soaker Tornado Strike uses swappable magazines a.k.a. Nerf Super Soaker Clip System Canisters. However, while rotating streams does offer better area coverage, the utility of the Tornado Strike is limited even when compared to the Super Soaker Helix as detailed below. 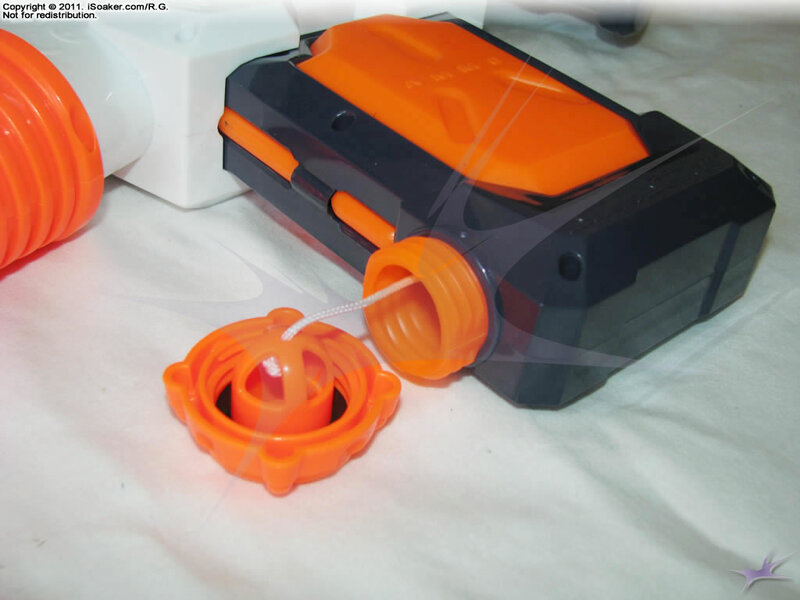 The Nerf Super Soaker Tornado Strike features two fixed-forward nozzles that are rotates as the pump grip is pulled towards the body of the blaster. This is similar to the Super Soaker Helix and the Water Warriors Cross Fire. The spinning nozzles create twisting streams covering a decent area, but having reduce range compared to a linear stream. Unlike the Super Soaker Helix, the angle between the nozzles are fixed and cannot be adjusted to make smaller or larger spirals. Unlike the Water Warriors Cross Fire, the Tornado Strike cannot disable the spinning motion and create linear streams. As suggested above, the Nerf Super Soaker Tornado Strike fires with every pump. The pump grip is also responsible for making the barrel and dual-nozzles spin. However, compared to the Super Soaker Helix, the pump volume is less meaning lower possible soaking potential. As well, the pump seems to be a little more difficult to pull than on the Super Soaker Helix. It is unclear whether the nozzles may be set to rotate a little more quickly, making pulling the pump feel more difficult than on the Super Soaker Helix. The trigger and grip area on the Nerf Super Soaker Tornado Strike, like the rest of the blaster, is well moulded and very comfortable to hold. 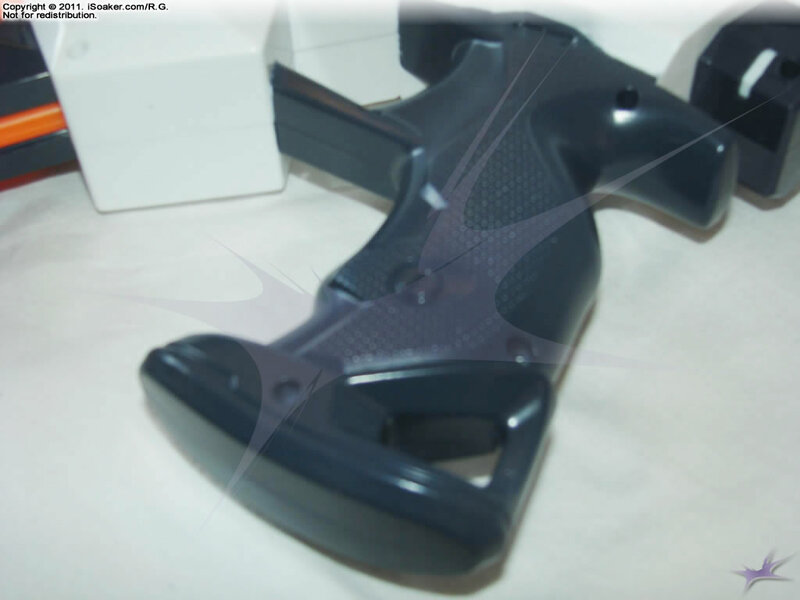 It appears that Hasbro Inc. spent a good amount of time refining their triggers and grips for the entire 2011 Nerf Super Soaker line. There even appears to be a place where a strap could be tethered through, though the blaster does not come with a strap. The Tornado Strike also features a tactical rail so accessories can be attached and it also comes with a removable, extendible shoulder stock. Altogether, these accessories really make for a much more intimidating-looking blaster. Like the Nerf Super Soaker Thunderstorm, the Nerf Super Soaker Tornado Strike makes use of Nerf Super Soaker Clip System Canisters for its water reservoir. This adds to the look and role-playing elements to this blaster and, of course, allows a user to carry around multiple clips for additional water on the field. 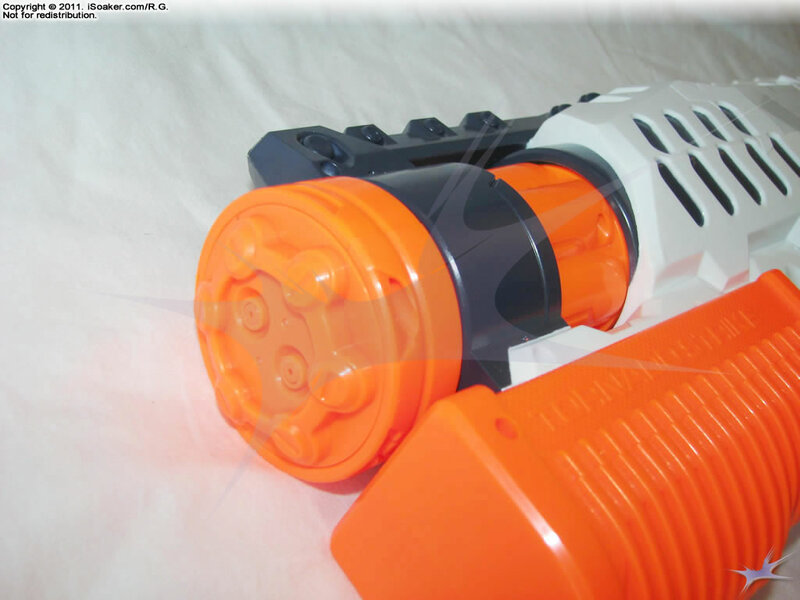 However, the amount of water held in each clip is not much, thus this blaster's soaking potential per clip is limited; the original Super Soaker Helix holds over three times the amount of water in its built-in reservoir. For the Tornado Strike, one gets roughly 10 full shots per canister before another one needs to be swapped in (or the current one refilled). 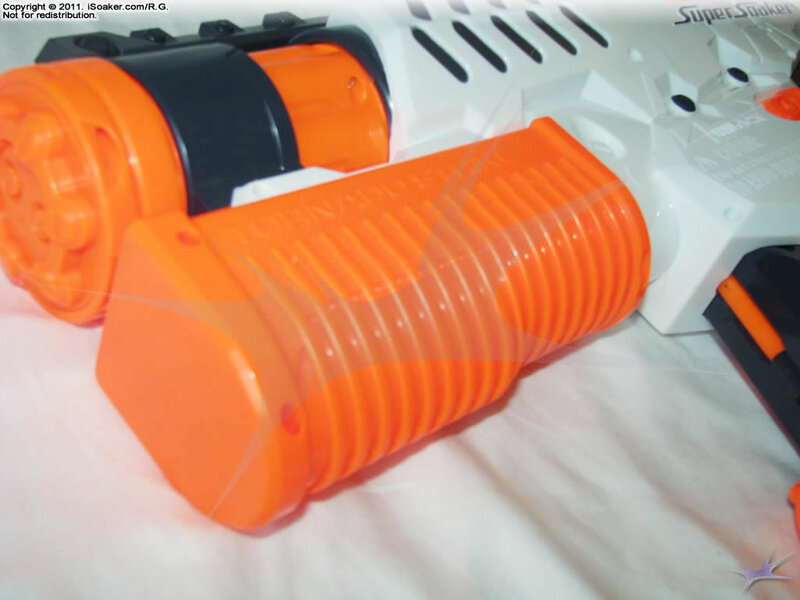 As a whole, the Nerf Super Soaker Tornado Strike is a well-built, nicely-styled water blaster with a unique spray pattern, but lacking in capacity. While its rotating streams offer greater coverage, range is reduced by this feature, thus works best for closer-range engagements. The ability to add on accessories is a nice, novelty feature, but does not add to its performance. Be wary if facing off against any true pressurized water blaster or any piston blaster of similar size or larger. Rotating streams have reduced range. Pump feels a little stiff when pulling. Magazine capacity severely limits soaking potential. Unable to disable the spinning action.